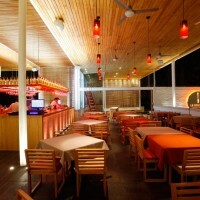 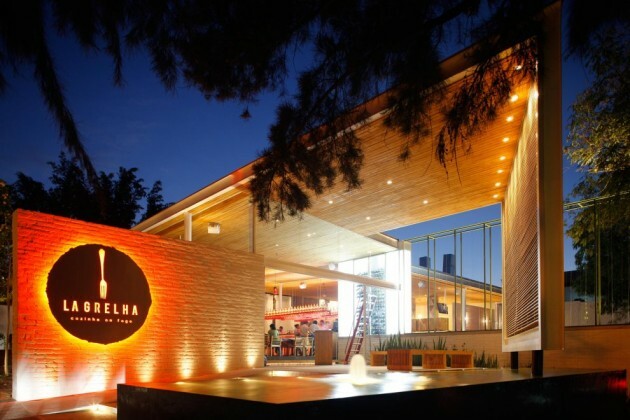 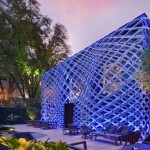 Hernandez Silva Architects designed La Grelha Restaurant in Jalisco, Mexico. 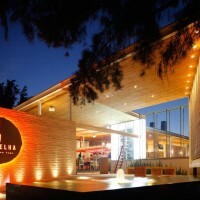 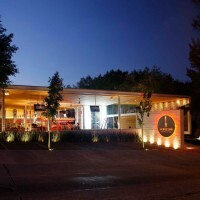 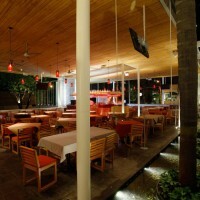 The gastronomic concept of the restaurant comes from its name, “La Grelha” which means barbecue in Portuguese, where all the formal concept of the project is created, the space is a high terrace on which fine columns stand and are topped by a nearly flat steel structure, and covered with wood that wraps and shapes the space, the walls keep the brick in a raw manner only painted in white, and are only used for the service area, a very thick wall creates a boundary and marks the closing of the street where the logo of the restaurant is also placed, the entrance is confined to the corner, it welcomes visitors and gives a very nice waiting room, this space also is bounded to the bottom of a metallic double curtain where vegetation lines climb to make a big green box that lights up at night and in the evening by the setting sun, there is also a wall coming down from the roof and floats above the water surface. 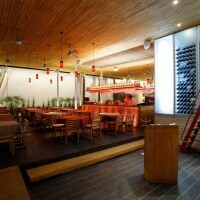 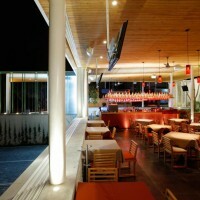 The interior space is clear and very bright, due to space where light interpass the ceiling, the bar is at the center and it is defined by a squared lattice, the bar divides a little the space into two, allowing one part to look over Street to the east and the other to the north where big trees in the side street can be seen, this area is elevated to trick the car parking, this space is prepared to extend a wooden platform area over the cars and to define an area for smokers. 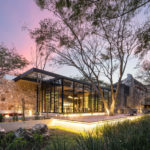 Both spaces are linked by a very long reflecting pool with wall of climbing plants to give depth to the space, at the background one can observe huge grills with their extractors. 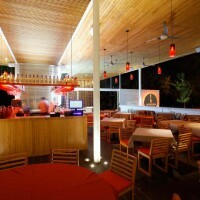 The whole place was built on a short budget, so we opted for the use of simple materials, even the red glass lighting is very characteristic of the region, the floor is quarry and most of the furniture is pine. 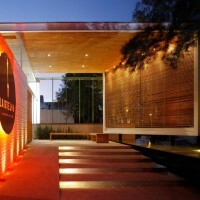 Guadalajara has a perfect climate almost all year, so making a terrace is ideal for this food concept, rain can be sometimes heavy but for very short time; here it can rain in one hour what falls in a city for a year, therefore the terrace has a hidden window behind wooden marimbas and only extends when the weather demands it. 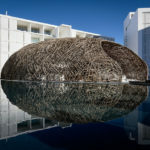 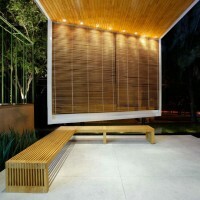 Visit the website of Hernandez Silva Architects – here.